If ever a result shows why I continue to harp on about giving anglers plenty of room when at all possible on commercial lakes to ensure a good day’s sport then take a good look at the Sunday Decoy Open match on the Beastie Pool. With few anglers on the lake, Ben Townsend put a massive 287lb 8oz to the scales from peg four. Don’t get me wrong Townsend is a top-class angler, but that sort of weight is usually only achieved when anglers have lots of spare pegs around them as he did on the day. Kevin Wadge came second with 173lb 13oz followed by Simon Godfrey with 138lb 12oz. Horseshoe Lake at Decoy rose to the occasion for some of the JVAC field on Sunday. Leading the way with 170lb 10 oz was Chris Saunders. He rarely strayed from a short pole line with meat to romp home from peg 13. 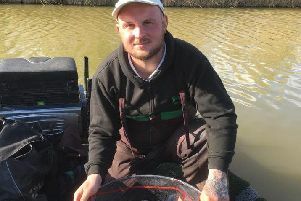 Dan Abbott on peg three took the runner-up spot with 106lb 12oz taken from the margins and then came Gus Gausden in third place on peg five with another weight taken close in for 93lb.